Has it ever happened to you that you were really excited to talk to someone or be with someone since you really miss that person but soon as you do, you fight? 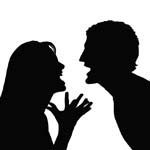 It starts with something trivial and then escalates until you're so mad at each other that you don't even know what you are fighting about and yet you can't seem to stop. This happened to me several times in the past and just recently. I don't know why in the middle of the fight, I just can't step back, breathe, and relax. The other person is pushed to the limit and starts fighting back. In the end, everyone is hurt and pained and no one is happy. How do you keep things from spiraling out of control?